In September, 1977, my wife and I traveled to the UK. We purchased BritRail passes that, in addition to giving us unlimited travel on railroads, allowed us to take ferries to neighboring islands. We somehow wound up on the tiny Isle of Bute in the Firth of Clyde off Scotland’s west coast. 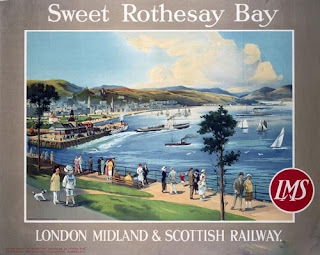 We stepped off the boat in the village of Rothesay which, during Victoria’s reign, had been a major tourist destination but had long since faded into obscurity, and procured a room in a B&B owned by a Mrs. D. H. Mowatt overlooking the bay. The sky was gray, the wind was chilly, it was drizzling intermittently and there was absolutely nothing for two 25-year-olds to do or see on Bute. We had lunch in a greasy fish and chips joint on the town’s only shopping street. At Mrs. Mowatt's suggestion, we took a mini-bus around the island and realized we were the only tourists; all the other passengers were elderly natives taking the bus just for the ride and to enjoy visiting with each other, swapping gossip in their thick Scottish brogues. They, like us, disembarked in Rothesay where they had boarded an hour before. We spent the afternoon in a penny arcade where we won ceramic mugs honoring the Queen’s twenty-fifth year on the throne. That night we went to a talent show at the local school where an ancient woman with a Florence Foster Jenkins voice sang “Sweet Rothesay Bay” a song that had been popular in Rothesay’s glory days in which a native who has left yearns for his home, and the crowd sang along. Back at Mrs. Mowatt’s we met an Australian couple who had been married the same day we were (December 27, 1975) and drank brandy with them in front of a crackling fire. It was, and we realized it even then, a perfect day. Rothesay was like Brigadoon, a mist-shrouded magical town that seemed to have appeared out of another time and place. We took the ferry back to the mainland the next morning along with memories of Sweet Rothesay Bay we’ll never forget. 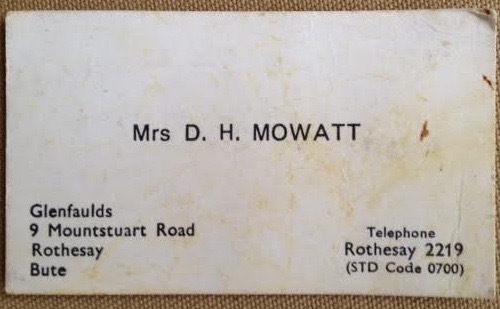 For years I carried Mrs. Mowatt’s business card in my wallet to remind me of that day and I still have it in the brass box at the top of my closet where I keep the things I treasure most. Years later, after we had begun collecting travel posters, we ran across the above poster in a Soho shop. It remains, by far, the most expensive poster we've ever purchased but we didn’t even haggle with the dealer – we had to have it. It is somewhere between 80 and 110 years old. For years it hung above the fireplace of our Connecticut house and today it’s in our Florida den, a room I rarely enter but whenever I do I’m transported for a moment back to that one perfect day in Sweet Rothesay Bay. 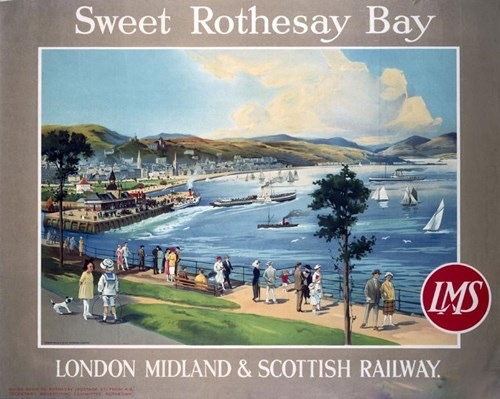 If you’d like to hear “Sweet Rothesay Bay” click the link below to a youtube video featuring an extremely cheesy lip-synched rendition by the Alexander Brothers that was shot in Rothesay. (And yes, that's a palm tree in the background. The isle of Bute is in the gulf stream so, in winter, the weather rarely dips into the thirties but, on the flip side, the average summer high is only around seventy.) Because it's sung in Scottish Gaelic, I'm printing the lyrics directly below the link. Sing along and may you, wherever you are reading this, have a perfect day. I’ve had a headache for nine months. And no, I not a hypochondriac or one of those people who likes to complain about illnesses to elicit sympathy. Just the opposite. I’m the kind of guy who visits a doctor only when I absolutely need to – e.g. if I were to cut off my arm with a chain saw. The headache started in mid-December. It wasn’t a migraine – I had one of those once in my thirties and it was God-awful – or one of those throbbing headaches you get with the flu or when you’re stressed. It was mild, a low-grade headache but, unlike other headaches, it wouldn’t go away. My vision changed, too. Suddenly computer screens, books, and labels I had always read with ease were blurry. I bought reading glasses. Problem solved. But the headache persisted. I figured the headache and vision change were allergy related. Here in Florida where the foliage blooms year-round, almost everyone suffers from allergies. The second week of January we were going to Baja, Mexico, where the only vegetation is cacti. I figured that once I was in the desert, the headache would disappear. It didn’t. The day we got home I saw my doctor. She asked how much time I spend on the computer. “Three or four hours a day,” I admitted. I saw the eye doctor the next day. He said my eyes were fine. So the MRI was scheduled for the following week. In the meantime I came down with a sinus infection I probably picked up on the return flight from Mexico. Every time I coughed the headache intensified ten-fold for a few minutes. I thought my head would explode. The doctor prescribed ten days of antibiotics. At some point during the first days of the sinus infection, my ears started ringing. They’ve been ringing ever since. Sometimes I hear crickets. Other times it’s radio static. Some nights the ringing is so loud I have trouble falling asleep. And it’s always there. I postponed the MRI – no way I could lie still for a half hour without moving when I was coughing every few minutes. 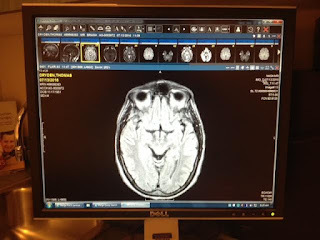 Two weeks later when I finally had the MRI it showed – surprise, surprise – a sinus infection. But everything else looked normal. My doctor referred me to an Ear, Nose & Throat Specialist who prescribed a second round of antibiotics. He said the ear ringing – tinnitus – had nothing to do with the headaches or sinus infection. I didn’t (and still don’t) believe that. He said to come back in two weeks for a CAT scan which, when I had it, revealed the sinus infection was gone. But the headache wasn’t. I went to another GP who, after running blood tests and examining me from head to toe, said he couldn’t find a cause for the headaches, vision loss or ear ringing. He said they might be caused by allergies and recommended I try Zyrtec for a month. Zyrtec did nothing, so he referred me to a neurologist. When, in early May, I was able to get an appointment, the neurologist asked me to rate my headache on a scale from one to ten -- one being barely noticeable and ten being excruciating. I told her it was somewhere between a two and a three, maybe a five or six for a few minutes after I leaned over to pick up something, coughed or cleared my throat. I said I could live with it – it wasn’t like I was having to spend the day flat on my back in a dark room – but it was annoying enough that I wanted it to go away if possible. She asked if I took a lot of ibuprofen. “I’ve had a headache nonstop for five months, you bet I do,” I replied. I also told her that for years I’ve taken an Advil at bedtime. I’ve always had trouble getting to sleep and it relaxes me. She said she thought the headache might be the result of too much ibuprofen. She advised me to lay off it and come back in a month. I did, but by my next appointment in June, the headache hadn’t abated one whit. 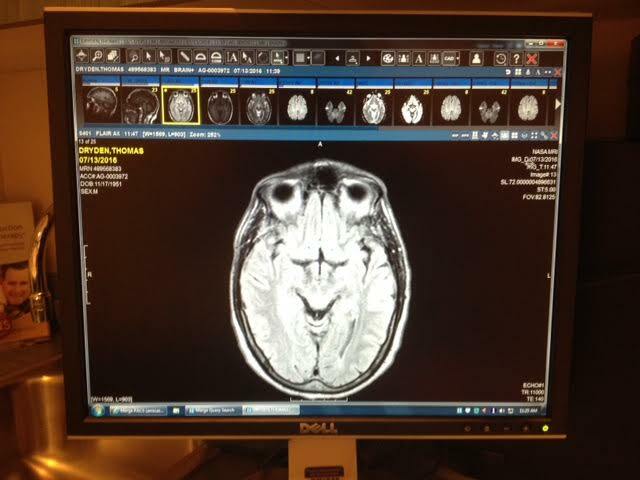 She ordered another MRI­ -- a brain scan -- and said she wanted me to see an ophthalmologic neurologist. That afternoon the neurologist’s office manager called and said the doctor wanted to move my next appointment, scheduled for early August, up to the next morning. “Is everything OK?” I asked. “All I know is she told me to call you,” she said. When I arrived I was shown into her office where, on the computer screen, there were half a dozen images of my brain. While waiting for the doctor to finish up with a patient in the next room, I took a pic of one (above). I rushed to the hospital and had the tests. “A lot of patients say they get headaches as a result of this procedure,” the doctor who stuck a needle in my spine warned. “I’ve had one for seven months,” I replied. I spent the next week reading up online about every possible infection – from AIDS to Zika – that could have caused my swollen meninges. Many were fatal. I was doomed. Then I remembered the neurologist’s office had sent an email inviting me to register for an online service that tracked all the documents relating to my health. I logged on and became obsessed with my blood tests and spinal tap results as they were entered into the system. Everything I was tested for I didn't have. Once all the spinal fluid and bloodwork reports were in, I spent the week before my next appointment convinced that the MRA, whose results had not been entered, had revealed an inoperable aneurism that could burst at any time and the doctor wanted to break that news to me in person. But the steroids did nothing for the headache. She asked how my headache was. “Still between a two and a three,” I told her. Since January, I’ve spent $6,500 – my annual insurance deductible -- on five doctors, two MRIs, an MRA, a CAT scan, blood work and a spinal tap. That’s over and above the $2,200 a month I spend on insurance for my wife and myself. I’ll turn 65 in November and be eligible for Medicare so, if I need more tests, at least I won’t have to pay for them out of pocket. Yay. “The good news is that, after all those tests and scans, at least you know you’re healthy,” the doctor said as she walked me to the front desk.